Uighurs and their supporters protest in front of the Permanent Mission of China to the United Nations in New York, March 15, 2018. China will retaliate "in proportion" if the United States sanctions its top official in the restive region of Xinjiang over alleged human rights abuses, China's ambassador to the United States said on Tuesday, adding that Beijing's policies in the region are to "re-educate" terrorists. Chinese Ambassador to Washington Cui Tiankai told Reuters in an interview that China's efforts to combat international terrorism are held to a double standard, comparing Chinese actions in Xinjiang to U.S. troops battling Islamic State in Iraq and Syria. "Can you imagine (if) some American officials in charge of the fight against ISIS would be sanctioned?" Cui said, adding "if such actions are taken, we have to retaliate." Cui did not elaborate on specific actions China might take. Beijing has faced an outcry from activists, academics, foreign governments and U.N. rights experts over mass detentions and strict surveillance of the mostly Muslim Uighur minority and other Muslim groups in Xinjiang. In August, a United Nations human rights panel said it had received many credible reports that a million or more Uighurs in China are being held in what resembles a "massive internment camp that is shrouded in secrecy." U.S. officials have said the Trump administration is considering sanctions targeting companies and officials linked to China's crackdown on minority Muslims, including Xinjiang Party Secretary Chen Quanguo, who, as a member of the powerful politburo, is in the upper echelons of China's leadership. Cui said that while the United States was using missiles and drones to kill terrorists, "we are trying to re-educate most of them, trying to turn them into normal persons (who) can go back to normal life," Cui said. "We'll see what will happen. We will do everything in proportion," he said, responding to a question on how China would retaliate to possible U.S. sanctions on Chen. Cui's comments are the strongest response yet to U.S. threats on the issue. Any such U.S. sanctions decision against so senior an official as Chen would be a rare move on human rights grounds by the Trump administration, which is engaged in a trade war with China while also seeking Beijing's help to resolve a standoff over North Korea's nuclear weapons. FILE - Chinese soldiers participate in an anti-terror drill in Hami, Xinjiang Uighur Autonomous Region, China, July 8, 2017. U.S. sanctions could be imposed under the Global Magnitsky Act, a federal law that allows the U.S. government to target human rights violators around the world with freezes on any U.S. assets, U.S. travel bans, and prohibitions on Americans doing business with them, U.S. officials have said. 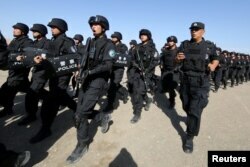 Chinese authorities routinely deny any ethnic or religious repression in Xinjiang. They say strict security measures — likened by critics to near martial law conditions, with police checkpoints, the detention centers, and mass DNA collection -- are needed to combat the influence of extremist groups. After initial blanket denials of the detention facilities, officials have said that some citizens guilty of "minor offenses" were sent to vocational centers to improve employment opportunities. At a briefing in Washington on Monday, a Uighur woman, Mihrigul Tursun, 29, told reporters she had experienced physical and psychological torture, including electrocution while strapped to a chair, during 10 months in Xinjiang detention centers. Tursun, who wept and shook as a translator read her prepared statement, said her three children were taken from her while she was in detention and that her four-month-old son had died without explanation in government custody. Rejecting Chinese government claims that the detention facilities serve vocational purposes, she said many of the dozens of other women in her cell were "well-educated professionals, such as teachers and doctors." Tursun said she witnessed nine women die during one three-month period she spent in detention, including from sickness after being denied medical treatment. Reuters could not independently verify her account, though numerous former detainees have begun to share similar first-hand details with media. China's embassy in Washington did not immediately respond to a request for comment on Tursun's statement. Independent assessments of the conditions in Xinjiang are nearly impossible given restrictions on journalists from openly reporting from the region. U.N. human rights chief Michelle Bachelet has called on China to allow monitors in Xinjiang, though Beijing has responded by telling her to respect China's sovereignty.